New satellite data reveals a rapid loss of tropical forests in Cambodia, parts of west Africa and Madagascar, and the Gran Chaco region of South America, analysts said Wednesday. Overall the world last year lost some 18 million hectares (45 million acres) of tree cover—equivalent to two Portugals—more than half of it in the tropics, the World Resources Institute (WRI) said. That is doubly bad news for the fight against climate change because the destruction of carbon-rich forests releases greenhouse gases and diminishes one of Earth's CO2-trapping "lungs". Even as Brazil and, to a lesser extent, Indonesia—the two nations with the most tropical cover—have slowed the pace of deforestation, the rate of tree loss has accelerated in other equatorial regions, the Washington-based research unit reported. 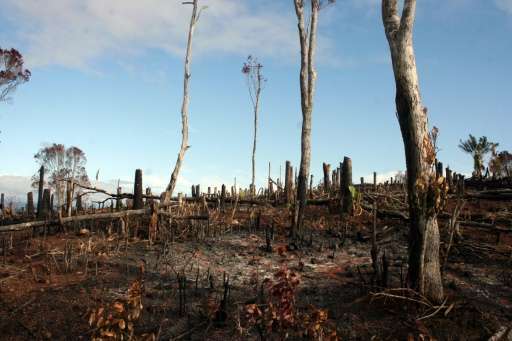 "The analysis identifies a truly alarming surge in forest loss in previously overlooked hotspots," said Nigel Sizer, global director of the WRI's forest programme. Tropical forests are being cleared to plant commodity crops or make way for commercial cattle production, he said. In Cambodia and other parts of the Greater Mekong region—where tropical deforestation has accelerated since 2001 at five times the global rate—natural forests have given way in large measure to rubber plantations. In the region straddling Paraguay, Argentina and Bolivia, soy crops and cattle ranches are replacing virgin forests that are also dense repositories of plant and animal life. And in parts of the Congo Basin, palm oil plantations and mineral extraction are the main drivers of forest loss. The countries affected are the Democratic Republic of Congo, the Republic of Congo, Cameroon, Central African Republic and Gabon. The island nation of Madagascar, meanwhile, lost fully two percent of its forest cover in 2014 due to mining, agriculture and the extraction of high-value tropical timber. Bringing tropical deforestation under control is a crucial plank in the complex UN negotiations set to culminate this December in a global 195-nation pact to rein in the threat of climate change. In all the countries covered by the new report, except China, changes in the way land is used, including deforestation, is the greatest single source of greenhouse gas emissions, the WRI said. The analysis was the first to use data from the Landsat satellite system, which can deliver global coverage every eight days. "We (now) have an unprecedented ability to monitor global forest change," said Matt Hansen, a professor of geography at the University of Maryland and a contributor to the research.